In a previous Telecast Thursday I gave you an overview of the Janome Circular Sewing Attachment; this week I'm going to show you how to stitch circles with it. 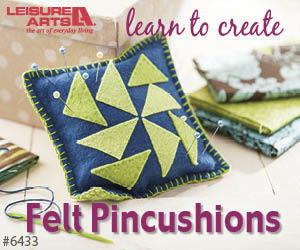 It's an easy and effective attachment to use - just watch out for that pointy pin! Much like using my rotary cutter - cut and close, cut and close - I always want to replace the plastic cap on the pin as soon as possible to avoid injury. I've jabbed myself a few times with it and it hurts, so do as I say, not as I do, and keep that cap on unless you really need to use that pin! Next week I'll show you more uses for this amazing attachment.